My goal is to be back on my usual posting routine once and for all. I've been neglecting both this blog and my personal finance blog, SavingsPinay for awhile and I'm really sorry. 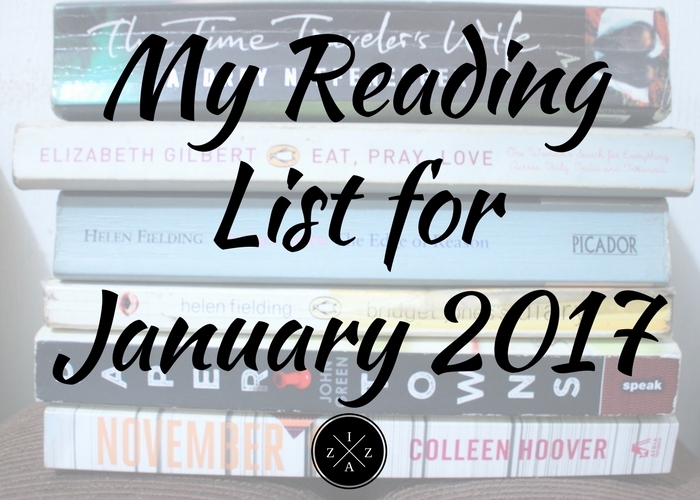 Now I have regained the motivation to blog again and I'll be starting the week with my books to read for January 2017. To make everything work again in terms of my reading goals I thought it would be best to share everything again and make myself more accountable. Since it is almost half of January I only set myself in reading three books. Here they are. This is the book I am currently reading. I have already finished this two years ago and I just feel the need to re-read it again. Eat, Pray and Love is a perfect book to indulge at the start of the New Year. It will set yourself on a good start and will make you do your own personal journey. There are several bits and pieces in the book that will make you happy in the inside. I'm excited to finish this for the second time around. Here is another book that have been on my reading list for the longest time. I was able to read it half way but didn't end up finishing. Paper Town is also part of my lazy day reading list and I've mentioned how this book can easily give you a soulful reading experience. The movie is great and I know for a fact that the book version is always better. I've always listed this book as part of my reading list but I always end up not making it to the end. I feel close to the book since the title is my exact birthday and finishing it will probably a good way to end the month of January.